Some 4,000 Liberians in the U.S. under Deferred Enforcement Departure (DED) will face the threat of deportation unless the White House acts to reinstate DED by March 31st. 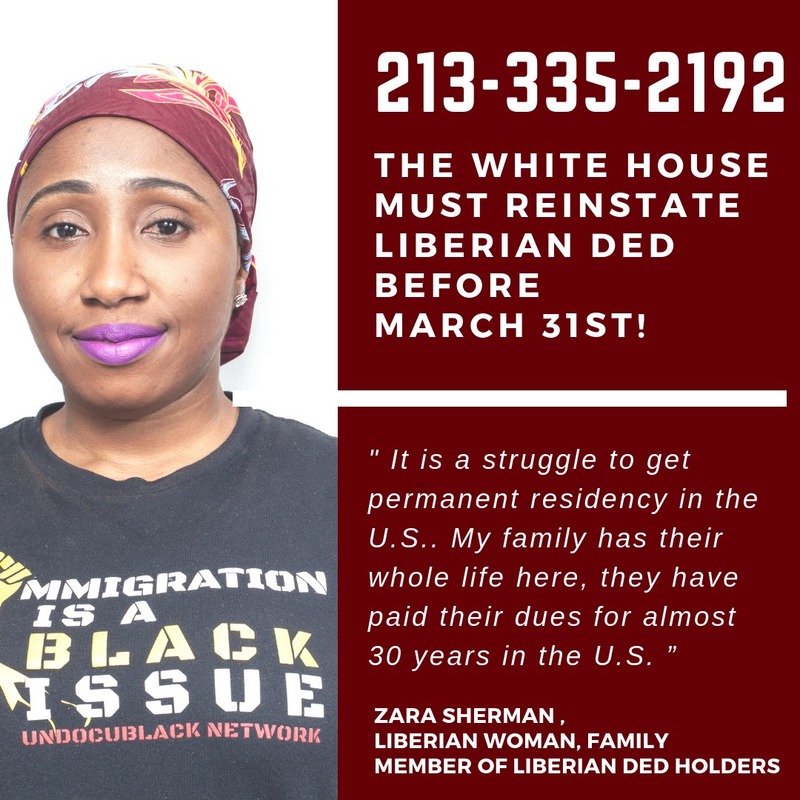 Our colleagues in the UndocuBlack Network and the Liberian community are asking for support to press the White House to take action. Today is a National Call-In Day, but calls must continue over the coming days! Liberia is presently the only country designated for DED -- a form of "prosecutorial discretion" authorized by the President, for foreign nationals who cannot safely return to their home country. Many of the approximately 4,000 Liberians with DED status have lived in the U.S. for years; they have lived, raised families, and worked here -- they are members of our communities. Without reinstatement of DED, they will lose their work authorization and immigration protection -- they will live under the threat of deportation and family separation. In the 1990's, some Liberian nationals in the U.S. had been granted Temporary Protected Status due to the civil war in Liberia. TPS had been renewed until 2007, when then-President George W. Bush cancelled TPS and instead allowed Liberians to apply for DED, which had also been renewed every 18 months until Trump announced last year that he would end it. Liberia continues to face economic and infrastructure instability, including consequences of the ebola outbreak; it is not a country that can adequately absorb returnees. Earlier this month, 50 House and Senate representatives sent the White House a detailed letter urging immediate reinstatement of DED for Liberians. The Dream and Promise Act recently introduced in the House also includes a proposal for permanent residency for DED holders. The "Secure Act of 2019", introduced in the Senate yesterday along with a new Dream Act, would also provide permanent protection for DED holders. A lawsuit has also been filed on behalf of Liberian DED holders, arguing "racial animus". The suit claims that Trump's decision to end DED for Liberians is "part of an overarching immigration agenda by the Trump administration to forcibly remove non-white, non-European immigrant families from the United States." However, the successful passage of proposed legislation is still down the road, and the outcome of the pending lawsuit is uncertain. Liberian DED holders and their families will be at immediate risk come March 31st, without reinstatement. Your support is needed now. Make the call to House and Senate congressional leaders. This is a special number that will connect you with one of four congressional leadership offices: Senator Chuck Schumer (Democratic Senate Leader); Mitch McConnell (Republican Senate Leader); Representative Nancy Pelosi (Democratic House Leader); or Kevin McCarthy (Republican House Leader). Sample script: "I am calling because you have the power to tell the White House to reinstate Deferred Enforcement Departure, known as DED. Liberian DED will end on March 31st, removing immigration protection and work permits from some 4,000 Liberian-Americans. They are a part of our communities in the U.S. Tell the President to reinstate DED." Thank you for your support and action!